Pumas, the official football team of the Universidad Nacional Autónoma de México (UNAM), have one of the most recognisable shirts in the world. The famous stylised puma face staring out, larger than life, from the front, leaves opponents in no doubt of who they’re up against. But, in fairness, the fixture list carries that off pretty well too. 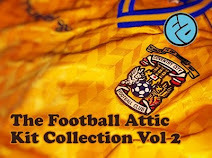 The danger with durative iconic kits - kits which have a rigid and distinctive starting point that designers have to work around - is that one season’s offering can blend into the next's. 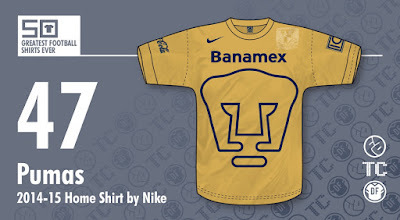 Nike, however, returned as Pumas’ technical partner last year and elected to put their stamp on things. I mean, literally, you can see the Swoosh. 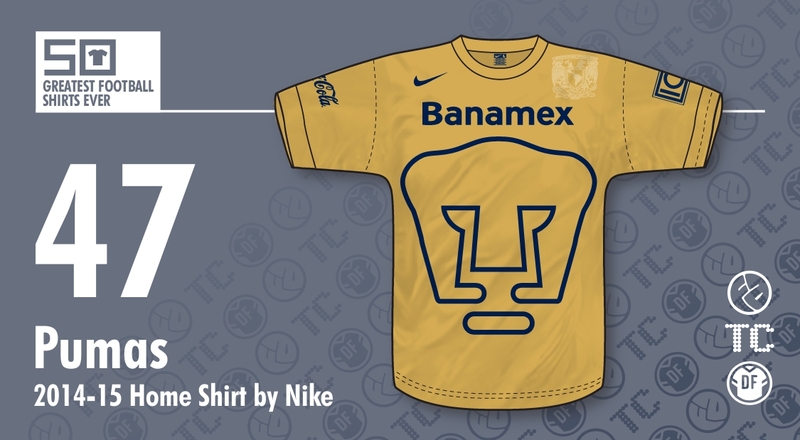 You can’t see much else though, because the 2014 shirt - celebrating the club’s 60th anniversary and billed as a nod to the 1976-77 version worn when Pumas won their first Mexican championship - is actually pretty minimalist. 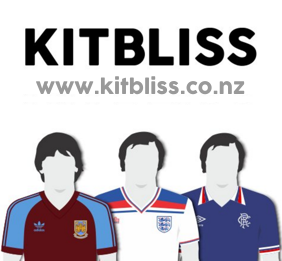 Rather than deploying the heavily embellishing approach that seems to be creeping back into kit design, Nike kept the collar and cuffs simple and non-contrast, complementing a slim cut and tastefully golden whole. That famous puma face? I see no evidence of it aping a seventies version, but the outlining lowers the contrast proportion to increase the cleanliness of the overall look. What? You’ve never heard of a “nice, clean design”? Cleanliness, see? And there’s even the university crest, though you’ll have to really search, as it’s embossed. Yes, that understated. 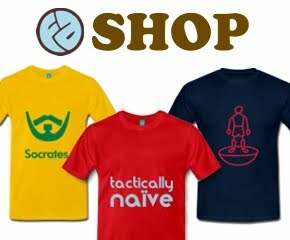 Of course, there are a few sponsors in navy too. But Banamex has become almost as familiar as ol’ catty cat across the front, back sponsors are just plain cool and Coca-Cola on the sleeve, well, as logos go, there are worse you could have. And at least they’re in navy. Full-coloured branding would have been a disaster here - instead, it’s just secondary colouring that classily finishes off the creation. The most impressive trick Nike pulled off was manufacturing, in my opinion, the greatest ever Pumas shirt - both unashamedly modern and faithful to traditions - when taking over from Puma. Pumas should have their kit made by Puma, always, or so I thought. No longer. The Transformers-evoking shirt - particularly so when one of their players is the spit of Shia LaBeouf - has never looked better, and probably never will. mmmm well... as mexican I can say that this shirt was very complicated, some people love it and some hate it, I thought that was a risky movement by Nike, sure.